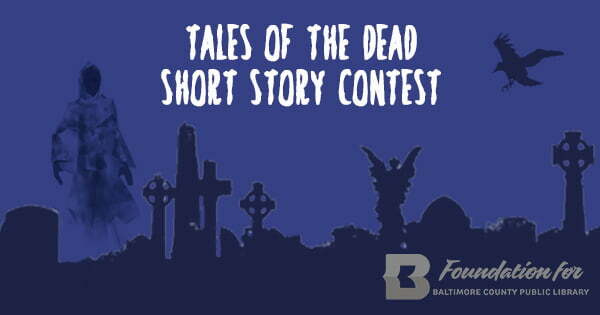 Baltimore County Public Library is challenging you to write your own original horror story. There are two catagories: Adult (21+) and Under 21. First, second and third place adult winners will be selected by a panel of judges including a librarian, a published author and a Foundation board member. Criteria for judging includes originality, fear factor and quality of writing. The adult winners and one guest each will receive tickets to A Toast Among Ghosts on Saturday, October 6, where the winners will be invited to read their stories around the ghost story fire pit. Winners will also receive an A Toast Among Ghosts T-shirt. The winning stories will be published on the Foundation website. Winners will be notified on September 28. While the event is 21+ only, writers under 21 can enter too! The winner will receive a prize package including an A Toast Among Ghosts T-shirt, books and a gift card. One winner will be selected in the teen category. Criteria for judging is the same as for adults. Under 21: include "Under 21 Submission" in the subject line and your age in the author information on the first page of your submitted file. All entries must comply with the entry requirements specified. Any entry that does not comply with the entry requirements will not be eligible for entry into the promotion. Entries must be received by 5:00 p.m. ET on September 21, 2018 to be eligible for consideration. If all required information is not included, entry will be disqualified. Foundation for Baltimore County Public Library is not responsible for late or incomplete entries. By entering this promotion, the entrant gives his/her consent for Foundation for Baltimore County Public Library to publish the story on its website and use their name for promotional and marketing purposes. Adult winners receive two (2) tickets to A Toast Among Ghosts on Saturday, October 6 and one (1) A Toast Among Ghosts T-shirt. Adult winners will also be invited to read their story at the Ghost Story Fire Pit at the event. Teen winners receive a prize package including one (1) A Toast Among Ghosts T-shirt, books and one (1) gift card. Anyone 21 years of age or older may enter to win the adult contest. Writers 20 years of age and under may enter the Under 21 contest. Employees of Baltimore County Public Library and the immediate family (spouse, parent, child, sibling and their respective spouses or step of each) and household members of such employees are not eligible. The contest starts at 9 a.m. Eastern Time ("ET") on August 1, 2018 and ends at 5:00 p.m. ET on September 21, 2018. Winners will be notified via email by Foundation for Baltimore County Public Library. Adult winners' names (plus one guest per winner) will be added to the guest list for A Toast Among Ghosts on October 6, 2018. Arrangements must be made to pick up T-shirts and the teen prize package at one of 19 Baltimore County Public Library branches or at the Administrative Offices located at 320 York Road, Towson, MD 21204.